Kiosk business in Dubai is known with the name of Retail Merchandising Units; Shop in shop, Retails Display Stands. These are the number of terms use to define the units install in the shopping malls; as well as in other high rushes area to sell or support your products as well as services. Our enthusiastic team of business setup consultants is knowledgeable in creating Kiosk business in Dubai. We promise quick approval from Gov’t department as well as from shopping malls and other venues. We are one of the top business setup consultants in Dubai for kiosk business in Dubai; which are use frequently all over the year; and with the help of our professional team we assist you in the setup of the kiosks at your desire venues. The city of Dubai where vast business opportunities for all kinds and size are available; because there continuously build new buildings; which create sufficient spaces for doing business on small as well as on large scale for entrepreneur. However, despite the availability of several business apartments; one may face with the difficulty of getting a place for setting up a business. On certain occasions it also becomes very difficult to find out suitable place; setting up Kiosks business in Dubai on a little scale for the reasons that spaces in well-established areas are either rare or very expensive; while there are little growth prospects for setting business in remote or newly established areas. Keeping in view the above circumstances; the best way for small businessmen is to set up Kiosks business in Dubai in numerous famous malls in Dubai. There are certain big malls existing in different parts of Dubai; where a large number of customers come on daily basis for shopping. In several areas, there are malls owned by multinational brands and most of local Emeriti and expat are visiting. One can expect huge profits after setting up small cabins or stalls in these malls. Therefore, these Kiosks business in Dubai in big and small malls provide best business opportunities; for the small entrepreneurs who can’t afford to purchase or hire space in business responsive areas of Dubai. For this purpose you have to ask the management of your desire mall; and then register your business activity from the Department of Economic Development (DED); to complete the process of setting up kiosks in different malls in Dubai. These kiosks are only allows in main land Dubai. The exciting color candy kiosks never miss the mark to attract shoppers at any place. These Kiosks are one of the main examples of retailing. Branded and gourmet chocolates are a hot favorite among people of all ages. Get the correct Chocolate kiosk from the wide range of options that we have at Business setup. Snack Kiosks need practical and functional design along with maximum attractiveness. Their average size of 10’/ 20’ has been proven to increase sales by about 30-40%. At Business setup we design, build and deploy kiosks that can bring the maximum ROI. Beverage Kiosks are one of popular forms of Kiosks and they can be for a specific brand or can contain a variety of drinks like smoothies, fresh juices, and also soda and so on. Pastry kiosks are little lifesavers when you need a quick sugar fix. This will save the time and effort needed to go to a food court or restaurant especially when you are hungry. 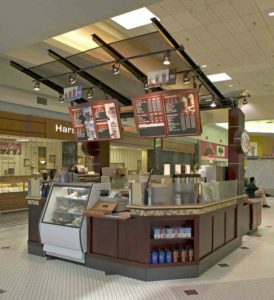 Get pastry kiosks designs from expert in-house designers at Business setup. This is one kiosk whose products will never be out of demand. We have a wide gallery of Ice cream kiosk designs that will surely help you in choosing the ideal one. Popcorn is the number one selling snack item in Malls, multiplexes and at other events. At Business setup we have a number of options for you to choose from and get the perfect kiosk enclosure. Every Cell phone brand has adopted this technique to step into areas where they cannot put in stores. At Business setup we can design kiosks that suit the brand as well as the location. Also mobile phone accessories retailers are now integrating Business setup into their marketing strategy to design manufacture and deploy kiosks at areas of high customer footfall. Jewelry is a foolproof product to start your kiosk business. All it requires is attracting the target audience in a strategic location. At Business setup we design and deploy the jewelry kiosks. Fashion accessories like sunglasses need kiosks that are structurally creative and as well as have captivating visuals. At Business setup we create exclusive kiosks for sunglasses which are trendy and catch the attention of the shopper quickly. Fresh, beautiful floral arrangements never fail to attract people. Flower kiosks need proper layout and layer shelves so that each flower arrangement is visible. If it’s about impulse selling, gift articles are a best lot. If you are particular about economies-of-scale, Gift Kiosk justifies the best. Benefit from investing in multiple locations instead of all eggs in one basket. If you want to set up business as kiosks in malls of Dubai; then have to follow these two steps for start of their expected profitable business. Kiosks are small stalls, which are mostly available inside the malls. These stalls vary in size but usually they cover a very small portion of the mall in which they are setup. In Dubai, a persons can set up kiosks in malls after taking permission from the management of a mall; and also if the management of the mall is agree in leasing the part of space in their mall; then they will offer the space for setting up the kiosk at the price of their desires. The big multinational malls may allow setting up kiosks but they will charge high rent for these kiosks. The rent is charge according to the space of the kiosk. If you are selling products suitable for elite class; then you can expect getting a good profit by setting up kiosks in these multinational malls. Other relatively smaller malls may allow you for setting up a kiosk in low price; that depends upon you to choose the mall; according to the products you intend to sell and the rent you can afford. Very small malls have little spare space and they usually don’t permit setting up kiosks. As compared to several other countries; you can not get a way only with the agreement with the mall management. In Dubai, you have to have the required permission as well as registration from the designated authorities. DED is the authority through which you can register your kiosk in any mall inside Dubai.